We all know the deeds of the Finnish Infantry in 1939 against the Soviet juggernaut, the fabled “Winter war”, very much a “David vs Goliath” contest. At sea, the situation was as much desperate with a numeric inferiority almost twenty to one. Despite this small size, the Finnish Navy (including coastal forts) managed to inflict losses and disrupted Soviet merchant shipping. Finnish TB S2, former Russian Sokol. All three were retired before ww2. At first glance, the Finnish Navy relied heavily on mines to protect her assets. There were no destroyers and the only three torpedo boats in service dated back from 1899. However a squadron of five German-built Submarines and MTBs completed a solid defence articulated around a pair of massive coast defense ships, almost coastal battleships comparable to what the other Scandinavian Navies fielded at the time: The Ilmarinen class. Finland, was since the Napoleonic wars a Russian Grand Duchy, and took her independence in 1917, seizing the opportunity of the revolution. She was fully independent with a constitution and established institutions in 1918, as a kingdom first, and later became a Republic. 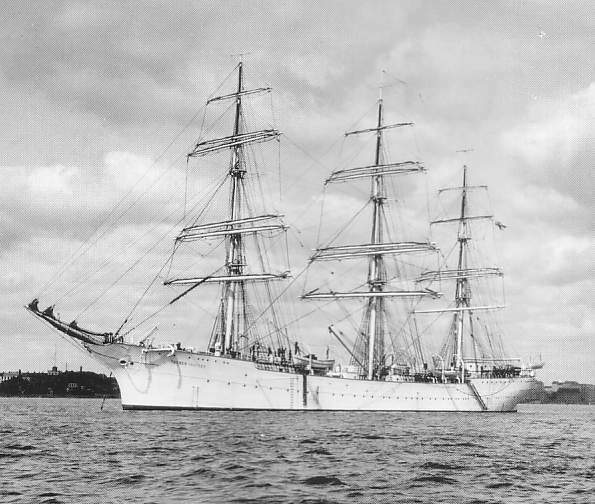 At that time, the Navy (Merivoimat) was constituted from the remnants of the local Russian squadrons abandoned in Finnish ports, a collection of prewar ships mostly in bad state. Suomen Joutsen, 1932. This was a former ex-German -ex-French 1902 Nantes three square rigged masts steel hull tall ship. In the 1920s, as the USSR settled and reinforced its army and ambitions, nearby Finland saw herself as a potential target and the modest budget that can be forged from a 3 million population called for a levy army. There was little left for naval ambitions, Finnish frontier being the focus of all attention. However about 1928, the parliament eventually voted a rearmament plan that was to be defensive and centered around two massive defense ships, submarines, MTBs and mine warfare ships. This became an exception however as in 1933, Army again receive priority, until 1939. -Three S1 class TBs (260 t ships, 1899, from seven Russian TBs of the Poslusnyi class, one foundered 1925, two stricken 1930). There were also C1-C4 of the 1902, 150 t class, later returned to Russia. -Klas Horn class sloops: Two 1891, 420 t ships, former Elbing-built Russian TBs Voievoda and Posadnik, both stricken in 1937. -Motors launches VMV3 (burned 1931), VMV4 (stricken 1939), VMV7 (explosion 1933). The Finnish Navy found herself threatened in 1939 by the invasion of the Baltic states of Estonia and Latvia, forced to gave their ports to soviet shipping and navy. Finland was “invited” to join, but did not met Soviet demands and an invasion took place on November, 30, 1939. 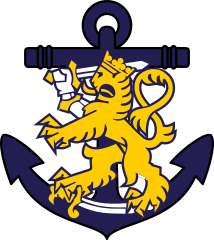 Form then on, the Navy contributed to fend off any Soviet attempt to make an amphibious assault, constraining the operations to the front held by the Finnish Army (see later, operations). 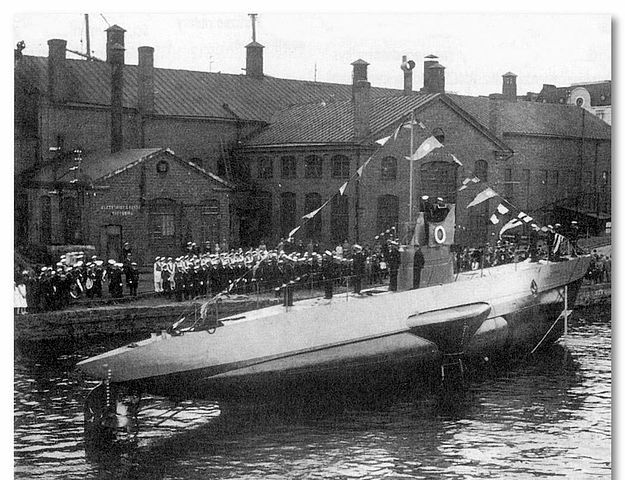 Coastal Finnish submarine Saukko at launch. She was too slow to operate effectively. 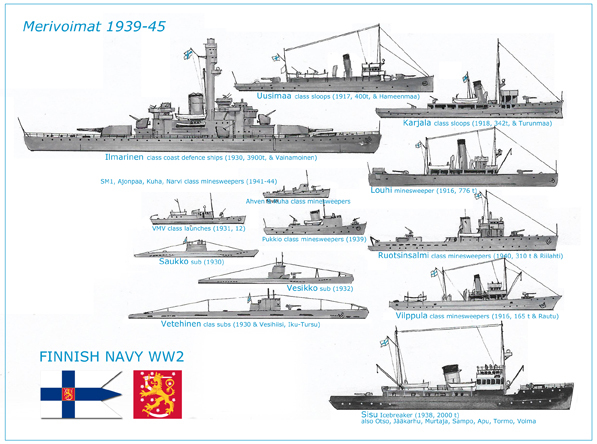 5 submarines: -Coastal submarines Saukko (1930), and Vesikko (1932), and those of the larger Vetehinen class (1930). 4 sloops: used as gunboats, two of the Hämeenmaa class and two of the Karjala class, 400 and 342 tons respectively. 6 minelayers: Louhi, 1916, 776 t, ex-Russian Voin. Pommi, Miina (1916, 80t), Paukko, Lieska, Loimu (1915, 60t) all ex-Russian. -11 of various types, A37-45 class, AF2, BVA, BVD and Haukka about 12 tons launches. Three were lost during the winter war. -8 icebreakers: Murtaja, Sampo, Apu, Tarmo, Voima, Jääkahru, Otso, and Sisu. The winter was saw restricted operations because of the ice. 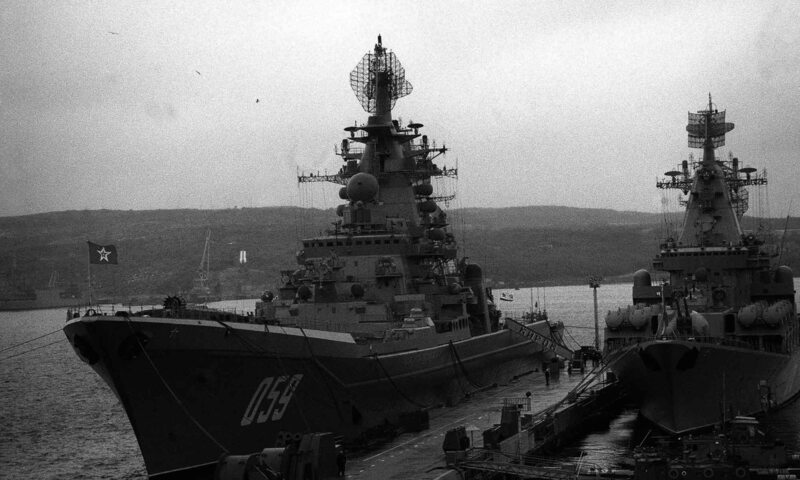 This however eased the navy staff task as to plan soviet possible routes to land troops or attack valuable targets, restricting the defensive perimeter (notably for coastal guns) and allowing to lay minefields more effectively. Finnish coastal submarine Vesikko, camouflaged, perhaps in 1941. On 3 July 1941 she sank the Soviet merchant ship Vyborg east of Gogland island. Vesihiisi class minelayers submarines and tender, prewar. The Winter war saw duels between Soviet ships and Finnish coastal batteries at Hanko, Finland, Utö and Koivisto. At Koivisto and Hanko Soviet battleships were forced to retire, damaged. However submarines Vesikko and Saukko failed to sink a single Soviet capital ships. From December 1939, ice prevented any move of the fleet but preceded by ice-breakers. The two coastal defence ships sailed in Turku and were used for AA defence, painted in white, remaining there until the end of the war. 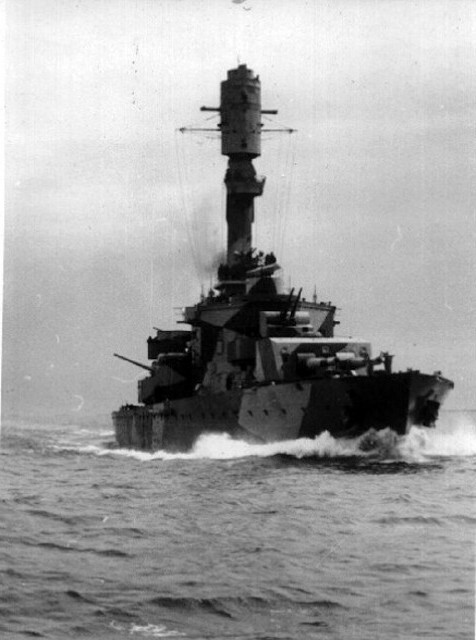 Praised at Spithead in 1937 for their beautiful lines, the two coastal battleships were initially deployed to the Åland Islands to prevent landings by Russian troops. 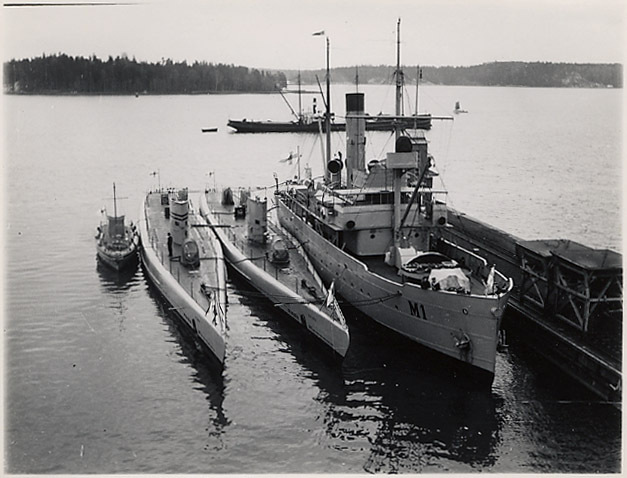 Transferred to Turku (in Southern Finland) later they served as floating anti-aircraft batteries. The Continuation War saw them resumed service, shelling Hanko Peninsula base five times from July to November 1941. 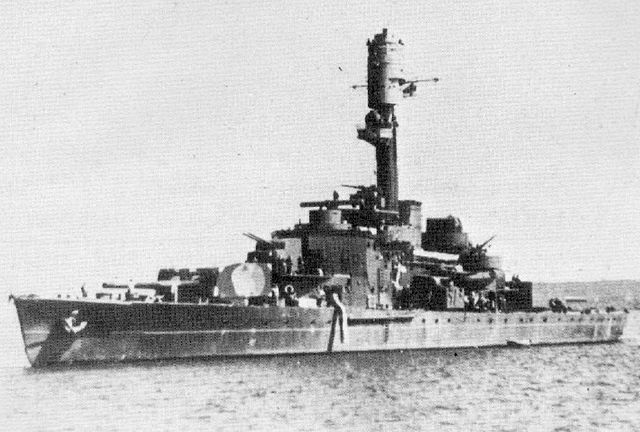 Ilmarinen later participated in Operation Nordwind (13 Sep 1941). On her way back she struck two naval mines, sinking within seven minutes adn carrying with her 271 men, although 132 survived. Submarine of the Vetehinen-class like the Vesihiisi laid mines in several occasions, sinking many ships in the process, being one of the most successful allied submarines in that area. Five MAS MTBs has been ordered from Italy in prevision to future operations. Hanko Peninsula soviet base then controlled the area and split the Finnish Navy in two. Coastal artillery positions at Russarö and Osmussaar guarded minefields barring the entrance to the Eastern Gulf of Finland. 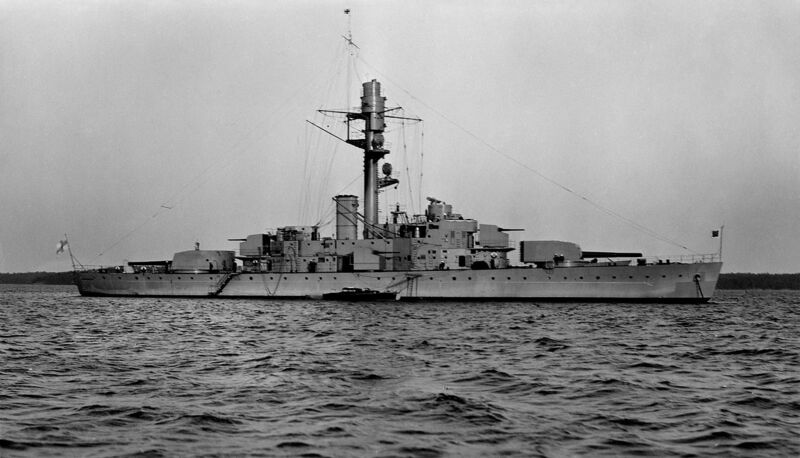 German Kriegsmarine assisted the Finnish Navy to lay large minefields and the coastal defence ships were soon back in action sheeling Hanko until it was evacuated Hanko in December 1941. Until 1945 all three belligerent laid som 69,779 mines and obstacles in the Gulf of Finland (16,179 by the soviets, 6,382 by the Finns, 45,000 by the Germans, included 3,000 magnetic mines). After the war, the area took until 1967 to be cleaned up effectively but estimations are still hundreds of mines has derived in the Baltic Sea, uncharted. 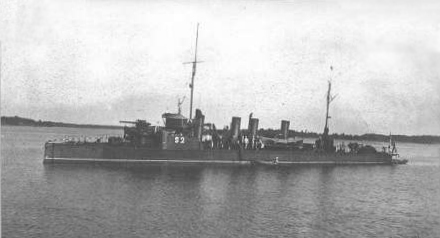 Soviet mines in particular claimed in september 13, 1941 the coastal battleship Ilmarinen, and survivors later served in the Lake Onega flotilla. In 1942 anti-submarine warfare took preeminence over other operations, with the axis fleets trying to deny Soviet submarines access to the Baltic Sea, which the mine barrier proved insufficient. The Soviet subs indeed managed to sink 18 ships, half of which being Finnish, although the latter claimed 3 of the 12 Soviet submarines sunk. Anti-submarine nets were later sank between Naissaar and Porkkala, completed by chanelling minefields which contained the Soviet ships to the eastern part of the Gulf of Finland until late 1944. From spring 1942 Finnish control of the island of Gogland proved valuable while the Soviets failed at seizing the small island of Sommers, shile the Finnish Navy received an addition of 14 new modern MTBs in early 1943. The 1944 a major soviet offensive saw Finnish troops at first holding their lines with the close support of the Finnish Navy in the Gulf of Vyborg (later evacuated). In September 1944 Finland switched sides, and attention shifted in the north, with German efforts to capture Suursaari (operation named Tanne Ost), failing in part because of the decisive action of Finnish MTBs. During the Finnish amphibious landing in Oulu, gunboats silenced German batteries, AA batteries fending off rare German air attacks while U-boats were chased off the Baltic. Camouflaged Väinämöinen, possibly in 1944. Motor Launches VMV19-20 (1943) extant 1980.